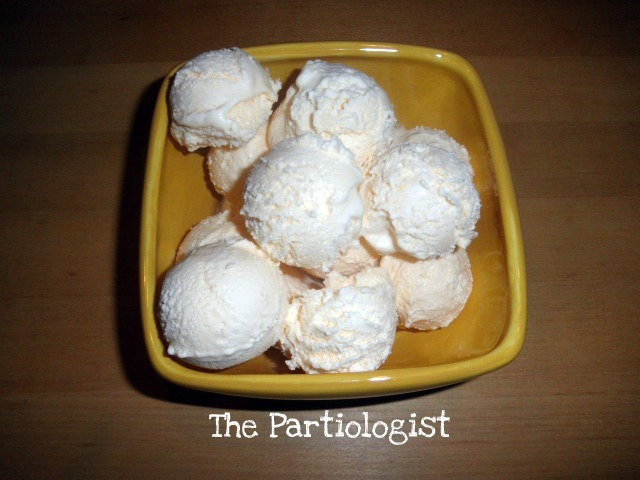 The Partiologist: Peaches & Dreams! In the land of peaches and dreams my wish was to create some kind of fruit smoothie. Well, I didn't really create it, I just made it! 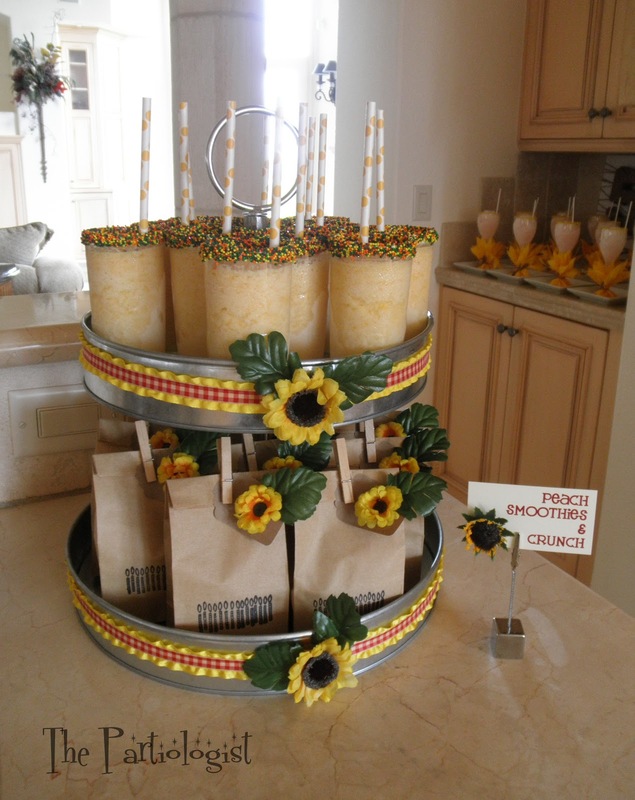 And served it up on my two tiered metal stand which I decorated with ribbon and sunflowers. And small bags of Popcorn/Pretzel Crunch served below. 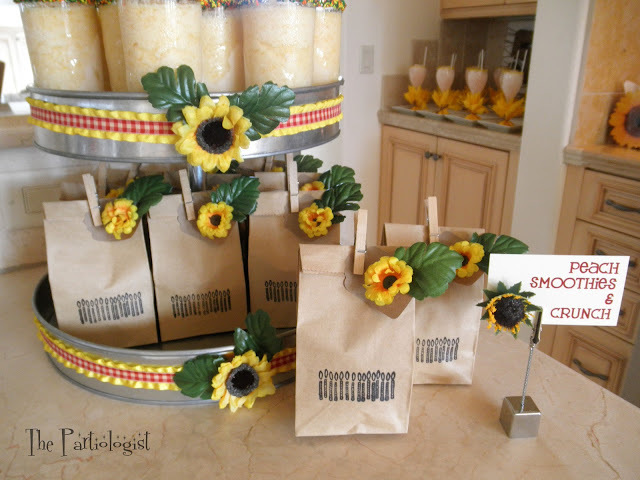 All of the sunflowers were clipped off the vine which I used for the invitations. This vine was COVERED in sunflowers! I found the candle stamp at Michael's in the $1.00 bin. I just LOVE a bargain! And if you wish you could make it too- your wish is granted! No recipe for the Crunch. Why? Well, because the recipe was called "Chewy Caramel Popcorn and Pretzel Bars". Lets just say these were NOT chewy and they were NOT bars. One thing I learned years ago in New Orleans while I attended a cooking demo was, what to do if something doesn't turn out as planned. You just CHANGE THE NAME! I was very happy with the way it turned out and even took a few two photos to go along with the recipe. Whew, so happy when that turned out. 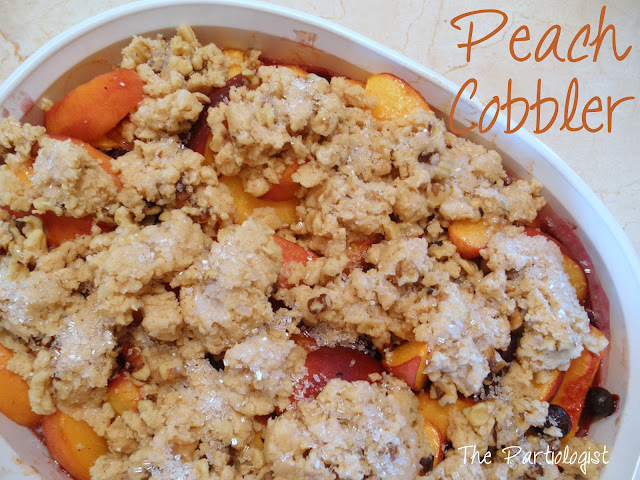 WAIT...Now that I think about it, my Peach Cobbler looks more like a Peach Crisp. Oh no, what should I do. Did more research and came up with yet another recipe. Super simple recipe. And while it was so simple, I didn't snap one photo. 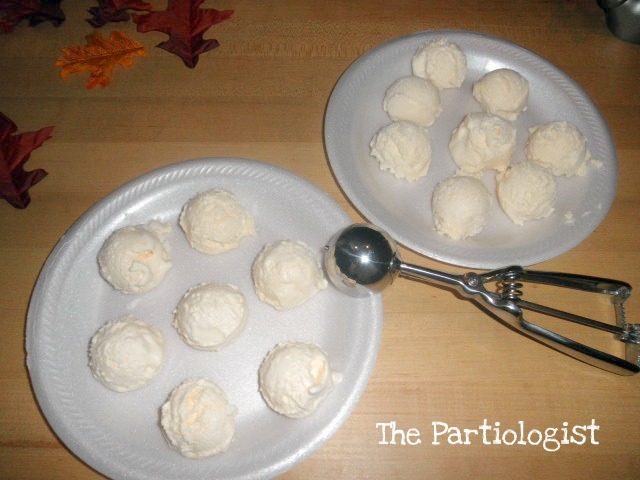 Scoop out several mounds of ice cream - lay it on a plate and freeze. After the ice cream is frozen, fill up the serving bowl you will be using and cover tightly with saran wrap, put back in the freezer until needed! 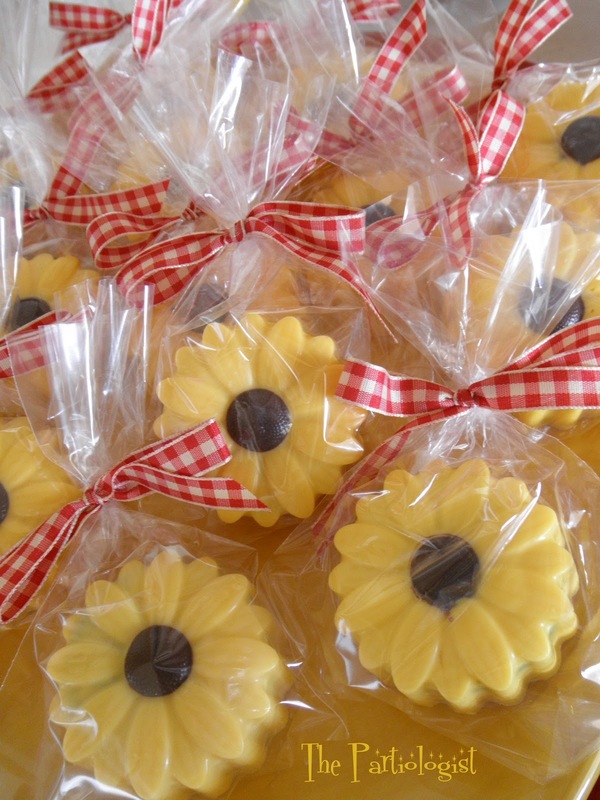 Candy Melt Covered Sunflower Oreo Cookies! 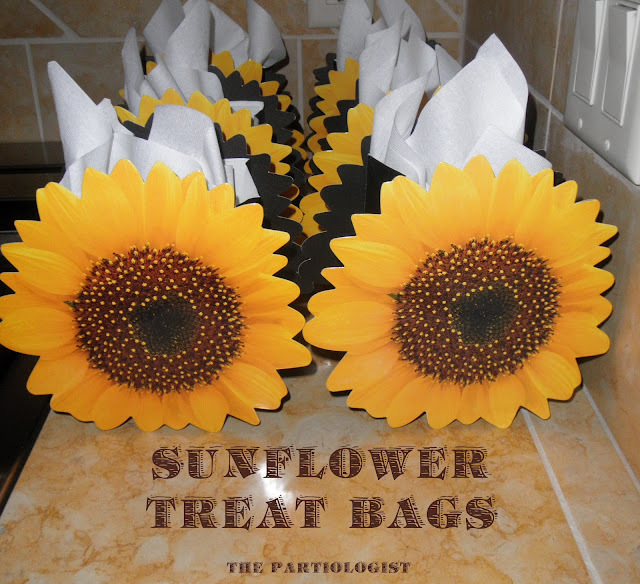 Can't forget the Sunflower Treat Bag! 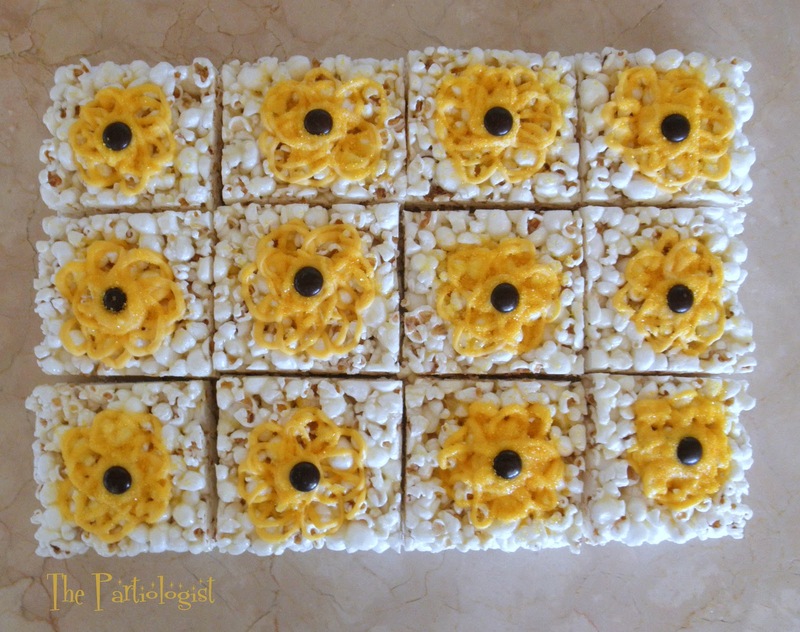 Filled with a Sunflower topped popcorn bar! Piped on with melted candy melts and sprinkled with sanding sugar! I hope I have given you a few bunch of ideas for YOUR Sunflower Party! Off to Peaches and Dream Land! Every detail of your sunflower party is just perfect. All of the treats, food, drinks, and party good you create are just amazing. The birthday girl must have felt so special sitting at your table. It's all so beautiful. but...but...all of these belongs to the same sunflower party????? you're simply amazing...You always surprise me. You're...fantastic!! Aw, and you're...the SWEETEST! Thanks for the comment! Peach smoothies and cobbler were the perfect things to make for this amazing sunflower party. Your ideas never stop coming to you and your execution of them is remarkable. I'm so glad I tried to make the cobbler, I found out that I love it! 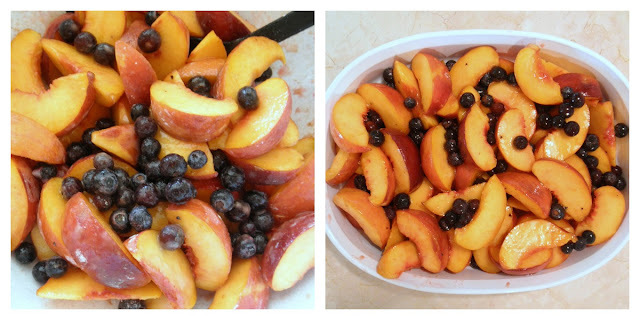 And using Fresh peaches (I forgot to mention that I didn't peel them) and blueberries were the best! It all looks so delicious! The peach cobbler looks absolutely wonderful! 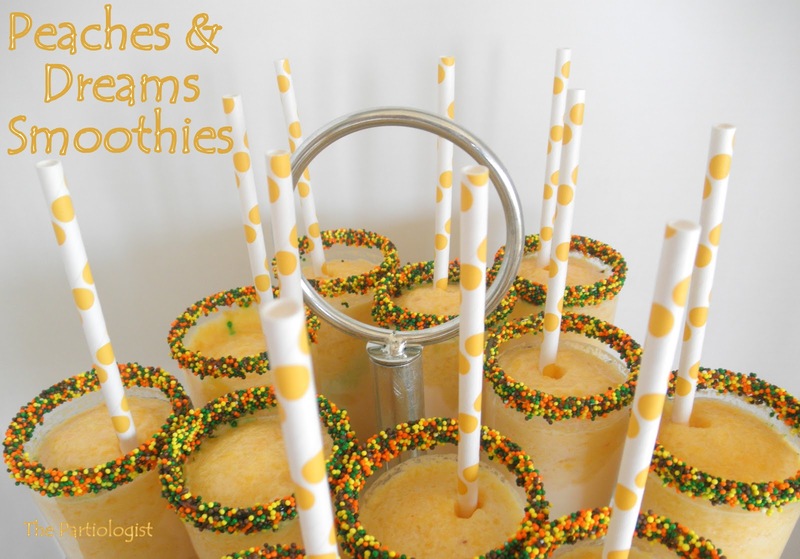 I may have to give that one a try:) You have such fun ideas! Thanks for sharing them! Thanks Maxwell - I hope you do give it a try! Fantastic!! I love how you scoop out the ice cream before everyone arrives! BRILLIANT!!!! I am SO making the cobbler!!! Great ideas, and thanks for scattering your bits of humor throughout your posts. You crack me up!! !